By coincidence, or maybe because of the common atmosphere found in regional contemporary art, this year all three Baltic State pavilions at the Venice Biennale are presenting projects that dig into the recent Soviet past and rework it through contemporary art practice. The urge to understand why Estonian, Latvian and Lithuanian artists, and their representing institutional bodies (as well as their national states), are still solving issues related to soviet history and the sharply shrill remnants still visible in post-Soviet neo-liberal culture, led me to invite art critic and curator Viktor Misiano to have a conversation with me. This year Viktor Misiano has curated a parallel show for the Venice Biennale, “Ornamentalism”, and he has worked on this same issue in several of his curated shows – such as “Progressive Nostalgia” (at the KUMU and KIASMA museums in 2007). In this conversation, Viktor Misiano provides a dense and useful theoretical framework for how to read and treat the traces of the Soviet past in contemporary art. Discussed in this conversation were such topics as: nostalgia and exotification; trauma and mourning as a way to deal with it; the artist as a creator of neo-mythologies; magical historicizing; neo-liberal marketing skills; and regionalism in the shadow of globalization. The reasons behind this discussion are the pavilions of the Baltic States at the Venice Biennale this year. Without having agreed beforehand, all of the artists have dealt with the Soviet past in one way or another. At least in Lithuanian Art, the soviet past – as a topic – has been entering artists’ minds and works since the early 2000s (e.g., Nomeda and Gediminas Urbonas and their projects “Transaction” and “Ruta Remake” , and some works by Deimantas Narkevičius). Do you have any explanation as to why these trends in contemporary art came into existence, and why they have recently peaked? I touched upon this issue in 2007, in a large-scale exhibition project with the programmatic title of “Progressive Nostalgia”. It consisted of four chapters – i.e., of four separate exhibitions presented separately in four museums (KUMU and KIASMA among them). That project was a reaction to that symptomatic turn mentioned in your question: with the beginning of “'00s decade”, in all post-Soviet countries we noticed a “return of the memory” (which was, in fact, the tittle of my KUMU show). If in the transitional 1990s the Soviet past was mostly erased, in the following, or second post-Soviet decade, it came back. And that was highly expected. It was par for the course that during the transitional age, this post-Soviet consciousness resided primarily in the dimension of the “here and now”. This can be explained by the “survival” mentality that was being lived and experienced by the whole of the social and cultural spheres at the time. It is only possible to survive in the most extreme conditions by using every single opportunity that might present itself in the present moment. In extraordinary circumstances, the past is not relevant – it has little to teach us and there is simply no time to waste before the future is upon us. The most important thing is to survive the “here and now” ! Note, also, that the reality of the post-Soviet nineties was also the impetuous process driving the formation and crystallization of the new political and economic elites. From the beginning – or to be more precise, from the middle of the 00s – over the whole of the post-Soviet space, an era of stabilization was promulgated. And this is as true for Russia, with its attempts at renewing its sovereign grandeur on the basis of its oil and gas pipelines, as it is for your Baltic countries, whose stability was sanctioned by Brussels. It is true for countries such as Kirghizia and the Ukraine, where stabilization has come to fruition as a result of instability becoming routine and second nature. And it is likewise the case for countries such as Kazakhstan and Azerbaijan, where stagnating ruling clans are clinging to stability. And however tentative and fictitious this stabilization seems, the main thing is obvious: actual consciousness cannot be found in the dimension of the “here and now”. Events have lost their former unpredictability, and it is not intuition that orientates us through reality, but an incomparably more complex system of analysis. The proposed practice for today, as well as everyday routine, attempts to be proportional to a longer period of time – put another way, to History. That is a set of circumstances that unexpectedly led all of us to a shocking, though obvious, revelation – The Soviet Union existed! There were people there! And we were among them! Yes, you are right. In the 1990s we were trying to run away from the past and build a stable future, but we were persecuted by a number of problems that were left unsolved. Do you think that trying to find a tie to the recent Soviet past is a way for artists to overcome their personas, or collective societal trauma(s)? I would use the term “trauma” with some caution and some reservations. Firstly, because it still has some accusatory value, which in the late 80s - early 90s authorized erasing the memory of the Soviet period. So, reading that historical past now, when it came back from oblivion through that key, could be an obstacle in gaining the most complete understanding. Still, secondly, I guess that term could be productive if we would accept Frank Rudolf Ankersmit's theses that trauma is an integral feature of Modernity, as well as Sigmund Freud's claim that trauma is the generative core of subjectivity. Thus, let us love trauma as ourselves! And if we want to define ourselves, let us understand our trauma. So then, tell me what your trauma is, and I will tell you who you are! That's why the historical oblivion of the 1990s turned out to be such an intellectual loss. If our subjectivity, by definition, is constructed from the traumatic past, to neglect it will inevitably impoverish our self-consciousness. Post-colonial scholar Linda Gandi noticed the same “wish to forget” in post-colonial India – a tendency to erase the memory of the traumatic past and to sustain the belief that since independence, everything has started from point zero. Let me here recall again Sigmund Freud. Specifically, his famous work on the “uncanny,” were he writes that the repressed returns in perverted, monstrous forms. In another of his essays, “Mourning and Melancholia,” he argues that mourning is a kind of work which (like any form of work) can be completed and deemed as successful or, on the contrary, be left uncompleted and unsuccessful. Failure to complete the work of mourning leads to melancholy, which is defined as the inability to separate oneself from one’s loss and the assertion of oneself and one’s loss as the center of the universe. And in fact, the enormous work with this “returned memory” – which began almost simultaneously in the cultures of nearly all post-Soviet countries – during its first phase, produced texts of memory rather than texts about memory. This type of post-traumatic text was termed by Dominick LaCapra as “acting out”: this refers to cases in which trauma is transferred into discourse, thus producing endless reproductions and rehashes of haunting images. As a result, neo-mythologism became, in most of the post-Soviet contexts, the most natural form for organizing such artistic texts. The model of the mythopoetic imagination, which is built on the “eternal return of the similar,” has been understood by contemporary artists as the free manipulation of a stable system of leitmotifs, thus enabling them to “package” persistent haunting images into certain abstract narrative constructions. Moreover, the role of the myth-making artist – the creator of a unique and universal authorial world – has proven to be the most natural form of realizing the post-traumatic urge to situate the self at the center of the universe. Still, the intellectual impoverishment (mentioned before) manifests here in the fact that the modern period in our countries coincides with the Soviet period. Therefore, the mythopoetic rejection of modernity immediately induces current consciousness to rehabilitate a pre-modern form of consciousness. Let me address another reference here. The Russian scholar Alexander Etkind defined post-Soviet neo-mythologism as a “magical historicism”. What is meant here is the specific experience of contemporaneity being at odds with the historical past. Therefore, any attempt to describe the reality of the present cannot help but intersect with the questioning of the past. Moreover, it is precisely the recent Soviet past that is the focus of particular interest and, simultaneously, the object of traumatic displacement, for the restoration of a natural connection with this past has existential significance insofar as it would guarantee the restoration of integrity to the lives of the greater part of the generations alive today. However, this past – personally experienced, but subsequently forfeited and forgotten for a decade – returns again as something utterly alien, mysterious, and almost exotic. Consequently, the effect of overkill, typical of post-catastrophic temporality, comes into play: striving to diagnose the present from a historical perspective, conscious attempts to leap over the immediate, trauma-ridden past, and retreat into an increasingly distant past. Still, Freud's “work of mourning” could take another direction – termed by La Capra as “working through”. It is not a matter of forgetting, which inevitably brings back what has been displaced and forgotten in the form of monsters and nightmares, but of a delicate balance between acceptance of memory and the capacity to construct new ties with life. From this perspective, it is not so important how objective that view of the historical past is (is it even possible to speak about an objective view of the past?! ), but how we long for it and need it to be! And that other direction became requested because the post-Soviet condition, which expired in the 1990s, became a solid reality, a subject of the distant critical gaze. And a critical view of things forced artists to shake their heads at the ideological games that had seemed unshakeable in the nineties. This critical view dispelled the direct equation between the market and democracy, between unfettered individualism and the welfare of everybody, between living human life to the full and consumption, between the dismantling of the state and the flowering of culture. This critical view has returned the concept of the equality of democracy with human solidarity, the idea of human existence combined with a spiritual quest and the notion of a culture striving for utopia. And this, inevitably, returned the very values that lay at the basis of that Soviet order of things which we had divorced ourselves from with such relief at the beginning of the 90s. Thus, whether consciously or not, the majority of the positions that are being set forth in the 00s, unlike in the past decade, are renewing the link with the preceding era. Constructing a dialogue with the past made it possible to free ourselves of its traumatic burden, while simultaneously recognizing its universal significance. This recognition has required the experience of the past twenty five years – and moreover, not only for the citizens of the former Soviet Union. As the American thinker Susan Buck-Morss declared few years ago, “We are all post-Soviet.” That is what I properly meant with my project titled “Progressive Nostalgia”. Thanks for the deep digging into the question and its context. It makes sense not to forget that we experienced not only a Soviet past, but also a modernistic one. Let’s try to look to more recent examples of re-playing the Soviet past and using it for contemporary art narratives. The 56th Venice Biennale is a good example of the resurrection of the Soviet past and what remains of it in contemporary post-Soviet societies. Moreover, the Biennale is a good indicator of what is happening in national art markets. All three Baltic State pavilions are dealing with these issues. Without any conscious agreement, the artists they brought to Venice are helping to reopen both personal and collective historical wounds. Everybody thought that these questions were already solved at the beginning of 2010. At the 2013 Venice Biennale, both the Lithuanian and Estonian pavilions dealt with very globally-orientated contemporary art issues. And now we are back to history, again. How do you personally read these three pavilions, and what is it about them that makes them relevant to not only us (who are still dealing with our own local issues), but to Western societies as well? I cannot stop thinking about the dangerous possibility of some people, i.e., Western audiences and the younger generations of Eastern Europeans born in the 1990s, seeing these projects as an exotification of the past. The second phase of globalization, which we are leaving now, is marked by the fact that the world’s global unity had been experienced and realized, which led to people becoming aware of common problems and interests, as well as to the generation of numerous social movements. Globalization now became political. Henceforth, involvement in a global dialogue would no longer be confined to promoting one’s identity; what mattered now is a personal testimony of how certain global issues played out in your region, and how this could be extrapolated to common problems. In other words, by the second decade of globalization, common narratives and common structures had been formed, each of them, however, with different perspectives of themselves, and each of which could have been a basis for universalization. In this situation, identity politics gave way to the politics of memory, which is particularly obvious in our post-communist countries. Here, as I just noted above, the rebirth of critical discourse has been impossible without clarification of the communist legacy, which is no longer criminalized. It has begun to be examined for something that was overlooked before: an alternative to the Western liberal model of modernization or, rather, the second component of the entire project of modernity. Thus, by restoring its involvement in modernity, the post-communist subject has been able to resist its ethnicization in a well-founded way. Likewise, by realizing its involvement in the other aspect of modernization, it has been able to imagine the possibility of a different model of globalization. It sounds to me as if in the 2000s, we allowed ourselves to recognize that micro-histories were present behind the overwhelming grand historical narrative of the communist party and occupation. At least in Lithuania, around 2010, much more research was done and many more books were published on the Soviet culture and its remains. These topics were taboo in the 1990s because, I suppose, the new democracies had to be justified by all sorts of different means, and new mythologies had to be developed and spread around. However, I keep receiving an increasing number of comments and questions about how long is this Soviet memory going to be employed in contemporary artworks. Some sectors of the audience are already tired of them, and hope that these issues will have been solved, once and for all. From these types of comments we can make the conclusion that Soviet memory issues are now only relevant to ourselves, and that they should be enclosed in strictly regional discussions. If we try to compare different types of audiences, I gather the reception of such artworks would be quite different. I mean, there is the generation which is now in its 60s, and which spent most of its life in the Soviet world; there is the generation now in its 40s, which spent half of their lives under the Soviet regime; and there is the generation now in its 20s, which practically did not have the Soviet experience, and whose cultural understandings were shaped by the rapidly changing neo-liberal environment. The latter generation had to either learn their cultural, social, political and economic behaviors by themselves, or they attempted to adopt models from the Western world, which were often not working. The Lithuanian pavilion has received quite a few negative comments from the older generations, but the younger generations look at the project with some fascination of the exotic (sometimes adoration), and even with some nostalgia towards this currently-fashionable 60s and 70s material culture. Do you have any comment on this? The discourse of the Soviet past is very much in the hands of historians and art historians. What is the role of the artist in this constant struggle with text-based discourses and their power in the rewriting of Soviet (art) history? For example, when Dainius Liškevičius, in his work MUSEUM, recreates several acts and presents them as manifestations of performance- and political art in Soviet Lithuania (two art forms which assuredly did not exist at that time), he takes over the role of the art historian and tries to claim that several politically motivated protests (that took place in the 1960s to 1980s) could be treated as art works. Some Lithuanian art historians do not accept these statements, or sometimes they even think that it is heretical to play around with the recent Soviet past and the national symbols of Lithuania. Both political and artistic gestures are addressed to the public. Therefore, a political message, if we want it to be effective, cannot ignore the performative aesthetic component. And an artistic message, by definition, is always bare of content and, respectively, is political (whether it wants to be or not). So then, the political and the performative are two basic categories with which to understand the late Soviet reality, as covered in the brilliant book written by Alexei Yurchak: “Everything Was Forever, Until It Was No More: The Last Soviet Generation”. So, I suppose that an artistic re-enactment of political and social facts is absolutely legitimate if it helps us to understand that reality in a new light, and if it adds something to our knowledge base. Let's close our discussion with your comments on the current Venice Biennale. 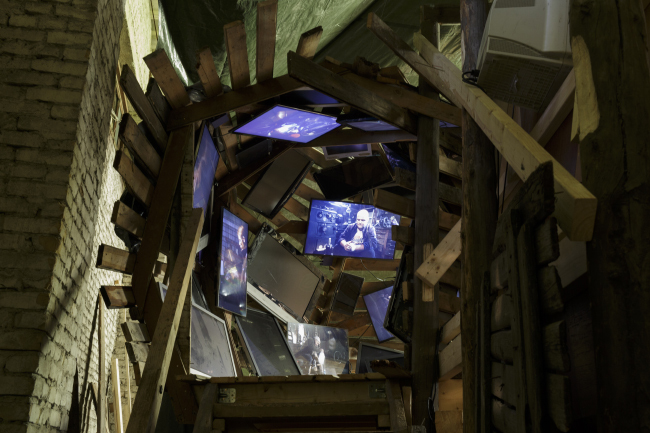 I have the feeling that, over the last ten years, the pavilions of the former Eastern Bloc have shown political and socially-engaged art more often than have pavilions from "the formerly Western" countries. My impression is that art in the “old country” pavilions" (e.g., the UK, France, Germany, etc.) is much more market-oriented and market-driven (and at the same time, less interesting for viewers like me) because they show either established or mainly aesthetically-concerned artists. This year several critics revealed that many pavilions were funded not only by the national states, but also by dealers, collectors and private foundations. This fact brings one to assume that probably many of the artists are being (re)presented in their national pavilions solely due to the galleries that stand behind them. Is the concept of national representation by a separate state in each pavilion still a productive, viable and relevant one? And finally, in closing our conversation: Do you have any more impressions and insights on the Venice Biennale that you would like to share? In my view, your perception that, in this post-communist era, representative work from the Eastern countries is more political than that from the Western ones is not entirely correct; but it is very symptomatic. I assume that you simply associate yourself with your part of the world, so Eastern curatorial and artistic projects seem more meaningful to you; they speak more to you than others do, and you gaze at them with particular attention. And that is confirmation that globalization, as proclaimed with the fall of the Berlin Wall, has its limits! We are still profoundly rooted within our native contexts. And that explains why, in each edition of the Biennale, usually a few new national pavilions proclaim some national crisis (although, perhaps not everyone does it as loudly). Nevertheless, what globalization definitely brought us is the complexity of identities: today we associate ourselves not only with our countries, but within the plurality of different collectives – regional, transnational and others identities. Most of them have full rights to be aesthetically expressed and represented. Considering that the Venice Biennale's mission nowadays is to be a worldwide representational hub, it should open its doors to that plurality of the collective subjects and agencies. That is the Biennale's future. Viktor Misiano lives in Moscow and Italy. He was a curator of contemporary art at the Pushkin National Museum of Fine Arts, Moscow (1980–90), and the director of the Center for Contemporary Art (CAC), Moscow (1992–97). In his freelance practice, he curated the Russian section of the 3rd Istanbul Biennial (1992), the 46th and 50th Venice Biennales (1995, 2003), the 1st Valencia Bienal, Spain (2001), the 25th and 26th São Paulo Bienal (2002, 2004), and the Central Asia Pavilion at the 51st Venice Biennale (2005). In 1993 he co-founded the Moscow Art Magazine and has been its editor-in-chief ever since. Vytautas Michelkevičius is a commissionaire and curator of the Lithuanian Pavilion at the 56th Venice Biennale. He has been working with the question of memory since 2011, when at the Tallinn Kunsthalle (Art Hall) he curated the show “Generation of the Place: Image, Memory and Fiction in the Baltics” featuring artists from the Baltic States; Michelkevičius later edited a book on the exhibition with the same title. Among his many research projects, he has been especially interested in the institutionalization of photography as a professional art medium during the 1960-80s in Lithuania, and has published a book on the subject.